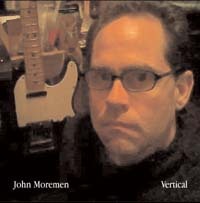 Guitarist, songwriter, drummer and prolific pop-smith, John Moremen has released and re-issued three of his best solo efforts on his Popstatic label; 1991’s self-titled “John Moremen”, “Punch Me In” from 1996, and his 2002 release, “Vertical”, featuring bassist and producer Chris Xefos, guitarist Tim Fuson and drummer D.J. Bonebrake of X and Knitters fame. Moremen is no stranger to the world of California pop, either drumming with the Sunnyvale-based Orange Peels, or playing guitar with Roy Loney; and he is equally at home with the roots rock groups of Northern Virginia that spawned him, groups like the Neighbors, Kevin Johnson and the Linemen and Last Train Home. These albums show Moremen at his best, a wonderfully, rollicking world of rock, pop and wit. “No Time to be Waiting”, the title cut from his latest album Vertical, is a fantastic introduction into Moremen’s style, and harkens back to some of his earliest efforts; a driving, tuneful, yet more matured sound. Like a fine wine, you can really appreciate it after hearing the energetic and younger material from his self-titled first album which nevertheless, is one of my personal favorites. Other guest stars like vocalists John Ashfield, Paul Myers and drummer Jeff Potts round out a great album. Early readers of Beyond Chron may recall that my first ever column back in April of 2004, featured Moremen and his tours with Washington Post columnist Eric Brace’s Last Train Home. Since then he’s done it all; from his drumming with the likes of John Ashfield, Alison Faith Levy, and Allen Clapp’s quartet The Orange Peels; to his experimental power trio of High Vulture with bassist Bill Raymond and MX-80’s legendary guitarist Bruce Anderson. Moremen’s versatility has unquestionably made him one of the Bay Area’s best musicians. On Punch Me In, Moremen is re-joined by Fuson and vocalist Mark Robinson for more pop fun on the XTC-like “Summer Sauce”. Originally recorded in 1996, this CD is a must for Moremen fans. Moremen’s use of some very clever chord changes and witty lyrics had me boppin’ and bobbin’ to “Back Inside (Where I Used to Hide)”, a playful, jaunty little tune that reminded me of his days with guitarist Peter Gilstrap and their group “The Neighbors”, with a dash of They Might Be Giants thrown in. The aforementioned “John Moremen” may yet be my favorite, perhaps because Moremen played virtually the entire album by himself. Tight, energetic as hell, and with a little help from Gilstrap and percussionist Peter Yorkunas, turned what began as a demo, into one of Moremen’s finest efforts. “You Seem So Happy”, “Too Many Times Around My Head”, “Broken Heel”, and “Sleeping Now”, capture the raw essence of Moremen in 1991, a songwriter at “the end of the beginning”. Moremen will no doubt enjoy a CD release party for his Popstatic anthology, and a star studded line-up I’m sure it will be. A new CD is in the works as well, and promises to be another jewel in his indy label crown. From his earliest days with Washington’s Alice Despard’s Hyaa! and Northern Virginia’s The Neighbors; to his forays with Jad Fair and Half Japanese; to the roots rock expressions of Nashville’s Last Train Home; and his tours with songwriter Allen Clapp and his pop group The Orange Peels, Moremen has proven his versatility and gift of genuine expression with his music and these timely re-issues.